The original USS Enterprise returns in of Star Trek: Discovery, complete with updated uniforms and re-imagined versions of those classic Starfleet insignia. QMx brings you exact replicas of the screen-used Enterprise badges. Plus for the first time ever, they are including with each badge a miniature lapel pin version of the same design. 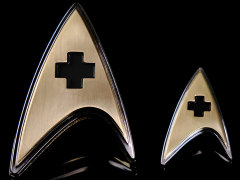 The Enterprise badges are inspired by the patches from Star Trek: The Original Series, but also fit in with the metallic designs created for Star Trek: Discovery. The metal badges are shiny gold with a brushed silver outline and a debossed division icon.